Today we are sharing our most magical Disney memories. I have to be honest, many of my Disney memories don't come from a visit to Walt Disney World. I have been lucky enough to have Disney in my life since I was a little girl. 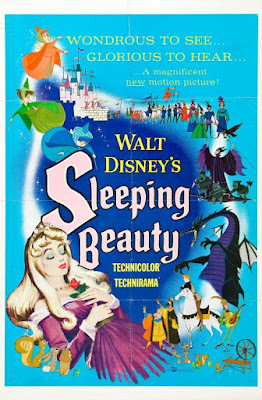 I have said this before but one of my earliest memories is of going to the theater with my older sisters to see Sleeping Beauty. How can you not love the scene with Flora, Fauna and Merryweather getting ready for Briar Rose's birthday party or Briar Rose dancing with the woodland creatures? To this day she is my favorite princess, and I think Disney's most beautiful princess. Another magical Disney time for me was when Ashley was young and we moved to Pensacola away from my family. We were living in a hotel and there was no way I was not having a Christmas tree for my baby girl!! She was 4 but she was my baby girl. We loved to go to the mall and look at the Christmas trees and our favorite was the children's tree. The one they had on display was white and hand so many beautiful decorations; colorful glass ornaments, glass ice cicles, candy garland, and lots of character ornaments with a great big bow on top. Well we couldn't afford to recreate that tree but we did go buy a new ornament on paydays and get fun Disney ornaments from Walmart and Kmart - and we chose to make out tree a Disney tree. That tree became a symbol for all of us who were working away from home and it helped keep us from being quite so homesick. To this day we still use the tree I bought (and really couldn't afford) that year and even though Ashley is married with children of her own she still has a Disney tree in her house and she uses some of those very ornaments. 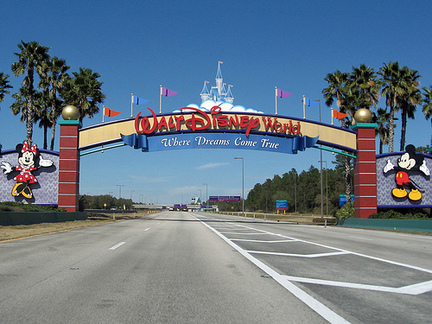 Of course, there are those magical Walt Disney World moments and none of those will compare to the first time I saw the Walt Disney World sign. It brought tears to my eyes and I knew I was going to have the most magical vacation of my life. How sweet that you remember going with to the movies your sisters! Hedy, I think I was about 4 or 5 at the time and it was absolutely magical for me!! It really did start my love affair with all things Disney!! Amy, I love how you have grown up with Disney and I hope to be able to do that with Lexi and Tripp. Don't forget my invite when you renew your vows! What a simply beautiful memory Donna. The fact that your daughter has continued the "tradition" brought a tear to my eye. Your family will always have the December Disney spirit! Thanks :D!! Ashley does have a true love of Disney and is passing it on to Lexi. Some of her fondest memories are us going to Beauty & the Beast and Lion King when she was little. I love that the Disney Christmas tree tradition goes on. Aww...I love how Ashley has a Disney tree with the ornaments she had as a child. Very special!